EquaGel® dry-polymer gel is almost rubbery to the touch. It has unbelievable tensile and compression strength and incredible durability; but these are not what make EquaGel® special. Its most amazing feature is the column buckling. Simply put, column buckling refers to the way EquaGel® behaves under weight. Each wall of gel is capable of supporting only a light load. When that threshold is exceeded, the wall of gel buckles into the hollow area between walls and passes the weight to the surrounding walls for support. This “buckling and weight-passing” happens instantly and repeatedly until the maximum surface area of pressing weight is evenly supported by largely equalized pressure (hence our name, EquaPressure®). Buckling Gel has been demonstrated to minimize pressure better than other technologies. The peak pressure points of the ischial tuberosities and the coccyx/sacrum buckle into the EquaGel® feeling almost as if they are free-floating within the cushion while the thighs and buttock of the user are supported. Our EquaGel® cushions feature a bi-columnar design of integrated gel. 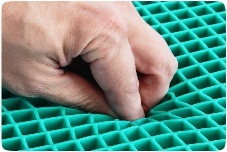 This means our gel cushions have a smaller top grid of gel incorporated with a larger bottom grid of gel. These layers cannot separate. 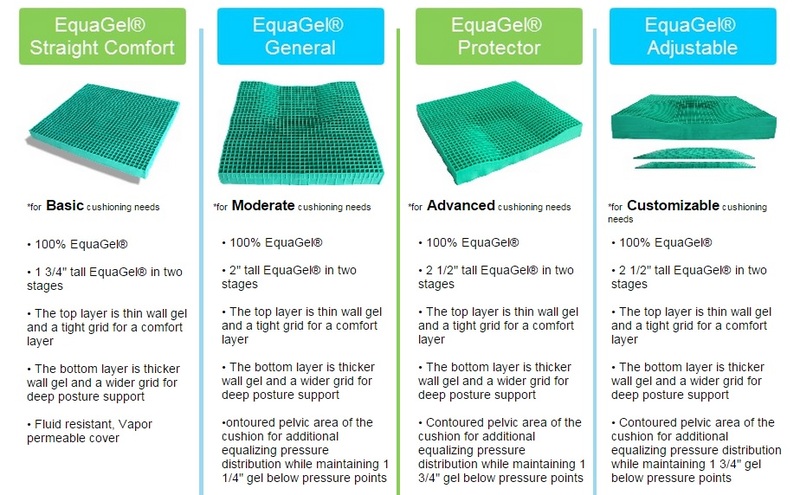 The top layer of EquaGel® is made of a small grid with thin walled gel. These walls of gel are not primarily weight-supporting walls but rather are pressure redistribution walls. 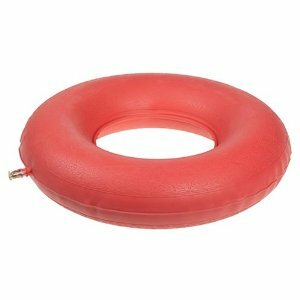 They are very soft to the touch and quickly act to distribute the user’s weight across the surface of the cushion and away from pressure points. The bottom layer of EquaGel® is made of a larger grid with thick walled gel. These walls are more robust and designed to continue the weight redistribution from above as needed and support the user in good alignment. They are also sufficiently strong (without becoming hard or resistant) to hold users from bottoming-out the cushion under normal usage. One of the terms you will see on our site, in our literature, and on some of our products is “skin protection.” This term originates from our experience in the US Medicare system for wheelchair cushions and patient care. The basic premise is grounded in the medical necessity for limited mobility persons to minimize the amount of pressure on their sensitive skin to avoid tissue break down. Pressure breaks down skin by limiting blood flow. The harder a seating surface, the more likely blood flow is inhibited. This pressure causes the skin and underlying tissues to weaken which may cause a wound. 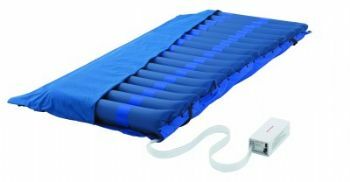 Our cushions have been demonstrated (using pressure-mapping devices) to lower the amount of pressure a user experiences at their pressure points. 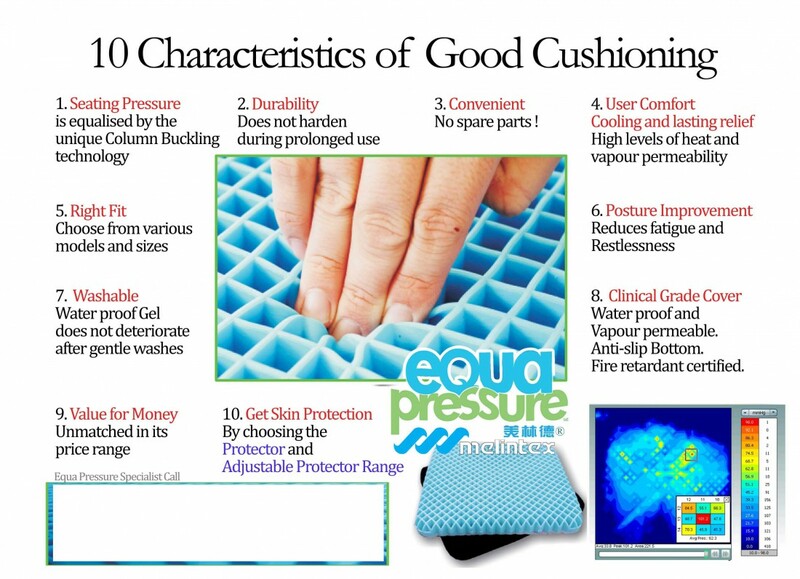 Thus when we refer to our cushions as ‘skin protection’ cushions, we are referring to the lowered risk of developing pressure ulcers in the skin due to the lowered pressure the user experiences from proper use of our cushions. Each of our cushions is designed to lower and even minimize the amount of pressure a user experiences. The main source of pressure and discomfort is at the “sitting bones” which are the ischial tuberosities and the tailbone. These pressure points carry the heaviest load when we sit and the surrounding soft tissue shoulder less of the burden. The vast majority of skin breakdown from sitting happens at or near these points. No matter a person’s gender or size, the sitting bones fall in a narrow range of area. Adding weight to your frame does not spread these bones out. Thus, no matter a users’ size the majority risk for skin breakdown does not move from the center-back of the cushion being used. The most concern in cushion design needs to be focused on minimizing pressure at these pressure points and in the tissues surrounding them. Our EquaGel® cushions take this into consideration. All of our cushions up to 22″ wide (55.8cm) are 100% EquaGel® for the entire wide of the cushion. For cushions wider than this, small foam ‘wings’ are added to make up the difference. We have chosen foams of high quality for the edges of our larger models that will properly support the user. 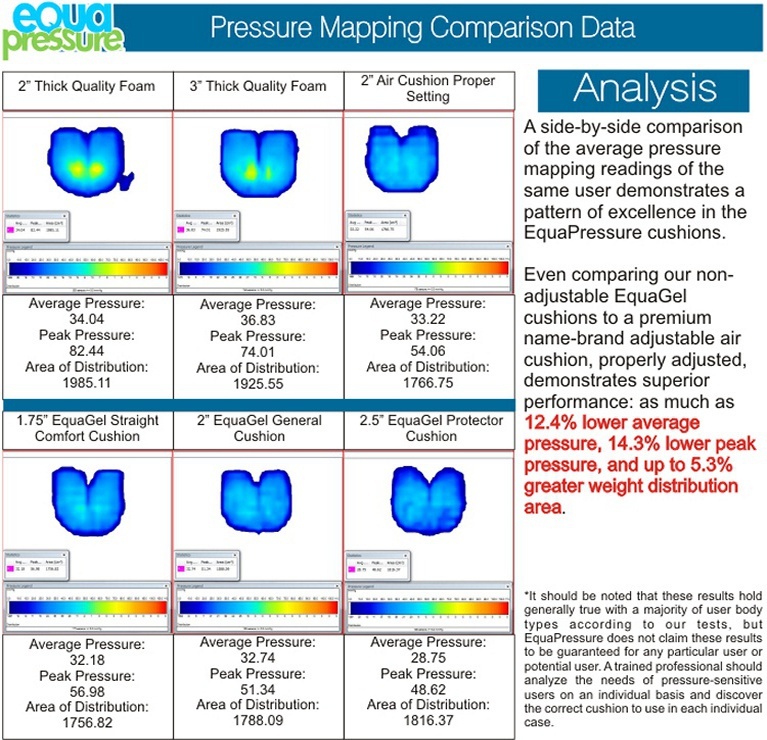 The EquaPressure Adjustable Protector cushion includes two additional EquaGel® components. These components are used to change the pelvic contour of the cushion from 1 ¾” to 2”, 2 ¼”, or 2 ½” deep and change the comfort experience. 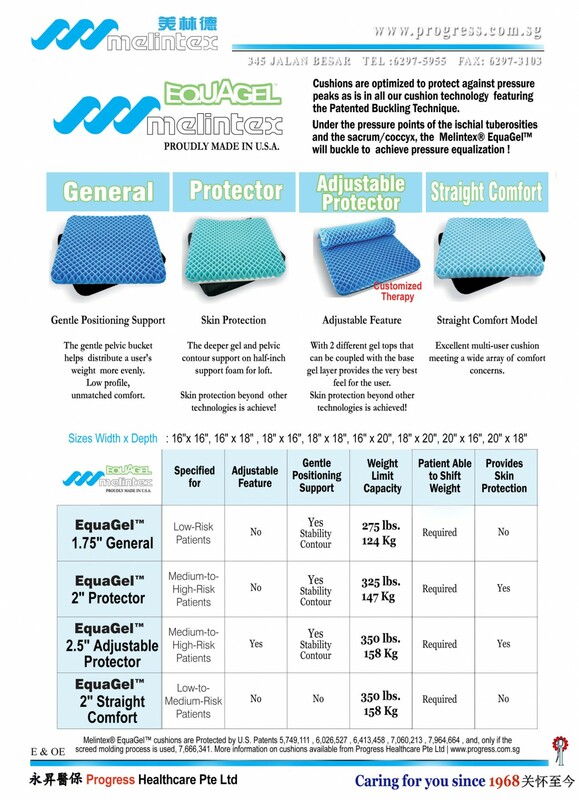 The EquaPressure Adjustable Protector cushion has 1.75″ of patented buckling EquaGel® beneath the pelvic contour. 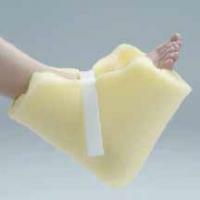 For users with changing or advanced comfort needs, they may want to add additional gel below their cushion. These are inserted one at a time or both together to change the amount of gel beneath the pelvis. That is the purpose of these additional gel components, otherwise feel free to wrap it over and put the extra piece onto your car seat. One component is 0.25″ thick and the other is 0.5″ thick. The outer layer of our cushion cover is a stretchy, water-resistant fabric. This fabric is a durable poly-knit fabric backed with poly-urethane that keeps liquid from penetrating into the gel cushion. It is, however, vapor-permeable. What this means is that while fluid cannot seep through the barrier under normal conditions, air is free to pass through the cover. Airflow is important to mediate heat distribution and a healthy microclimate. A water-resistant barrier that also blocks airflow may create a heat trap. EquaPressure covers do not trap air. 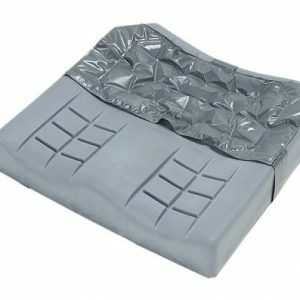 The base fabric is a standard low-slip material with velcro sections to help secure the cushion to certain wheelchairs. Fire requires three ingredients to survive; oxygen, heat, and fuel. If this cover catches fire, the FR layer first creates a char layer that will inhibit the spread of the flame by limiting the amount of fuel. The inherently fire resistant fibers give off vapor-phase retardants at the fabrics’ surface to slow the flames’ progress. Then the heat stable cores maintain a framework for the char layer with reduces the flames’ access to the cushion materials (fuel). Thus by minimizing and possibly eliminating the fuel, fire is minimized or extinguished. This barrier does NOT use topically-applied FR chemicals; it uses inherently fire-retardant fibers. While our cushions meet the flame resistant standards of the Cal TB 133 burn test, we do not claim they cannot or will not catch fire. We do not claim they will extinguish flames or protect you from fire, smoke, or burns.